See how Cedacri has been useful at Cassa di Risparmio di Cento. See how Cedacri has been useful at Akros. See how Cedacri has been useful at Reale Mutua Assicurazioni. See how Cedacri has been useful at Edison Energia. See how Cedacri has been useful at Miroglio Group. 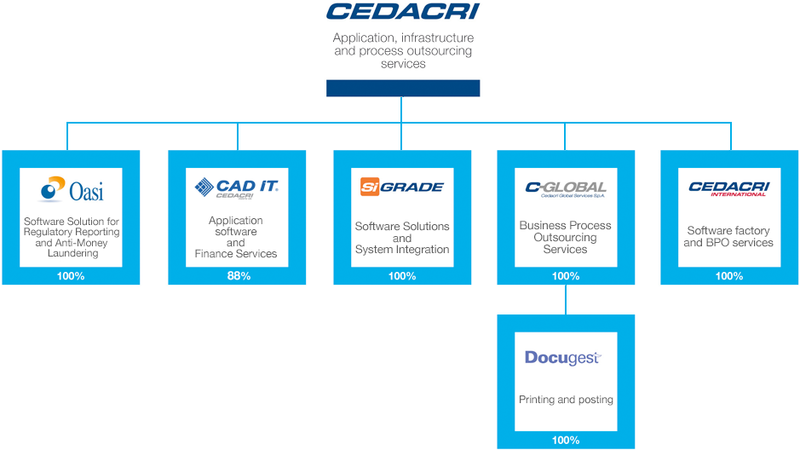 Cedacri Group, for 42 years focused on the development of outsourcing solutions, occupies a leading position in the market, guaranteed by more than 150 clients including banks, financial institutions and industrial companies, who are able to provide a full range and Integrated Services. The consolidated financial statements 2017 amounted to 329 million euros.